Memoria y ordem dos reglamentos ... Mazon- a Banoth. Memoria y ordem dos reglamentos q:s estilam observar, na Pia Irmandade das orphans, Mazon- a Banoth. 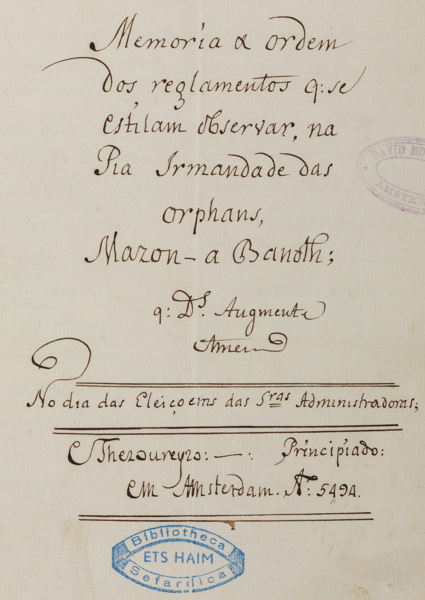 Regulations, lists and by-laws concerning the establishment of Mazon Habanoth, orphanage for girls, Amsterdam 1734. Portuguese / Paper / 20,4 x 15,7 cm. / [247-261] ff. / Current 18th century writing.